⚓ T55397 Building 2.8 failing on Windows. Building 2.8 failing on Windows. Don't think this counts towards a bug ,but not sure where I should post this. I'm not sure why ,but I can't build 2.8 anymore. It stops as the same point and I tried three times yesterday and just a minute ago. It seems these errors are related to stuff in the "\blender\source\blender\alembic\" folder. From looking at the build.log it looks like "abc_mesh.cc" is causing this? I have built 2.8 hundred times with no issues ,so I'm assuming this is code related? This is where it stops when building. Feature requests, see the developer contact page. Items that are already on our To Do list. 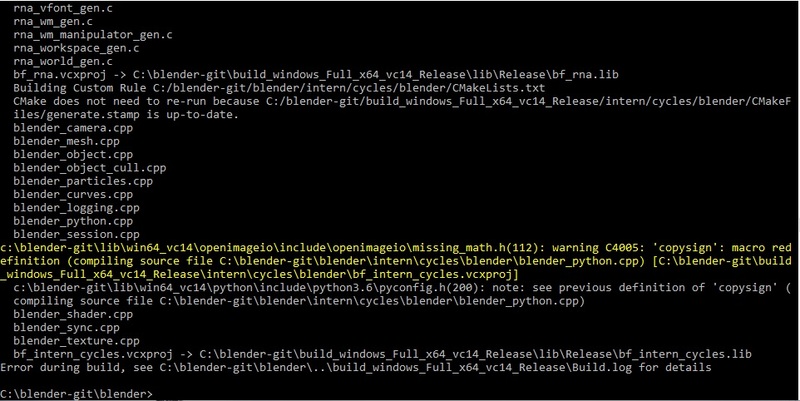 Compile or build issues, ask on #blendercoders or mail bf-committers. given the rules, i'll have to close your ticket, that being said, i looked at the issue and notified the dev working on that code, should be fixed today.